The fact that I can find rhubarb is a major spring clue. You see the constant chilly wind and rain that’s been happening in the mitten is making it feel much more like early fall than bike-riding, ice cream-eating, patio beer, weather. But, rhubarb gives me hope. 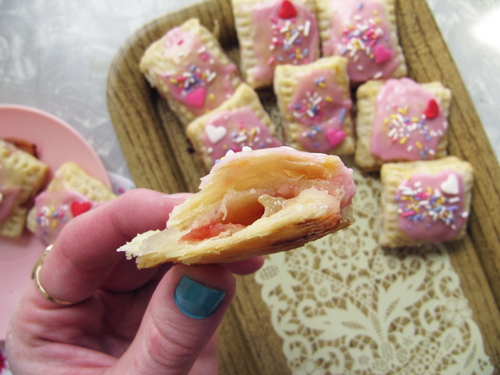 So yesterday, I opened my windows and made these mini pop tarts in an attempt to get spring to hurry up and get here! If you’re feeling casual, make the pie crust today and do the rest tomorrow! I almost did that for these guys. I mean, I’m finally watching The Wire and it’s making it so easy to lounge instead of bake. Elliot agrees. 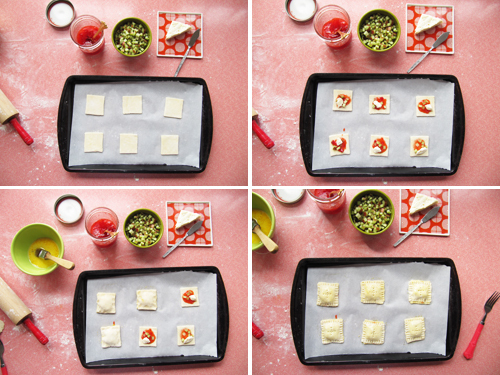 So make these little spring pastries! They’re flaky, sweet, and dreamy. And I mean, we go together like strawberries and rhubarb, so it’s just meant to be. *Use as much as you think you need for each! These amounts worked for me. Combine flour and salt in a mixing bowl. Cut in butter using a pastry blender or 2 forks until mixture is the consistency of coarse cornmeal or tiny peas. Sprinkle cold water over dry mixture 1 tablespoon at a time, tossing mixture lightly and stirring with a fork. Add water each time to the driest part of mixture. Continue stirring with a fork. The dough should be just moist enough to hold together when pressed gently with a fork. It should not be sticky. Divide dough in half. Pat each half into a disk and wrap in plastic wrap. Chill for an hour. Preheat your oven to 375F. Line 3 baking sheets with parchment paper (or one and reuse it). Roll out one disk of dough until about 1/8 inch thick. Cut out 2 1/2 inch squares of dough topping half with about 1/2 t jam, a few pieces of rhubarb, and a little bit of brie. Brush the outside edges of the topped squares with the egg wash. Brush the outside edges of another square of dough and top the filled square. Press together with a fork. Brush the tops with more of the egg wash and poke twice with a fork. Bake for 15 minutes or until golden. Repeat with the rest of the dough and filling. Make icing by whisking the sugar, raspberry juice and milk until slightly thicker than a glaze. Spread over each slightly cooled pop tart. Top with sprinkles. These might be a bit more toaster strudel-y. P.S. Oops, I only painted my thumbnail so far. Okay, first of all, THE WIRE. Enough said on that. Amaze. Second of all, I can’t believe you have rhubarb already! None in Toronto yet, and we’re not that far away from the mitten. Third of all, last week I pinned your Strawberry Rhubarb Sweet Rolls to be my first rhubarb recipe to launch Spring ’13, but this may bump it out of the #1 spot. Fourth of all, if strawberry & rhubarb were a celebrity couple, do you think their name would be a) Strubarb or b) Rhuberry? Personally, I like Rhuberry. Has a nice ring to it, right? Thanks for making my day, Robyn! You’re a delight! 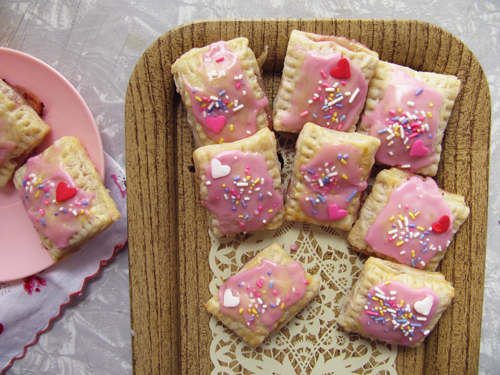 I have been itching to make homemade pop tarts for ages. These look so cute and delicious! I’m jealous that rhubarb is popping up where you are. We still have snow on the ground and rhubarb is still a ways away. However, I will totally try these and change up the filling with ingredients that I have access to. Holy yum. Yes! The rhubarb was totes an impulse buy because how could I not?! I can’t wait to se what kind of pop tarts you make! These are too cute! Rhubarb is giving me a little hope but some sunshine and warmth would give me more. I hear ya! This rain is making me crazy! I’ve been looking for rhubarb EVERYWHERE recently because I know it’s coming, and I was planning on making a strawberry rhubarb pie, but that’s being abandoned and when I find it, I’m making these! I mean, cute, delicious, and they have brie?! Nothing is better in my book. Pinned! Hope it pops up soon where you are! Everyone needs strawberry rhubarb pie, fo realz. These are to cute. as if you eat them!! I just want to make them and stare at them… ya right… they would be gone in 5 sec!! These are adorable. 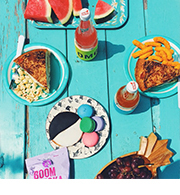 I love that you combined three fruit flavors. I actually just made strawberry hand pies, sans icing. Oooh! I’ll have to check out your hand pies! Whoa shut UP with these. 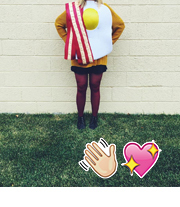 I lurv rhubarb and brie and strawberries… and pop tarts! And so cute too! Must do this very soon. Um, excuse me, I thought I had already commented on these about how much I liked them and obviously I was drinking or too busy punchdancing. 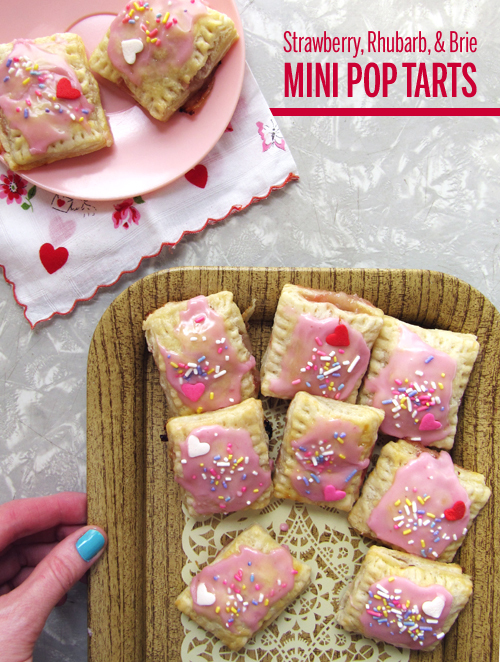 I have yet to make my own pop tarts and these look like the perfect first time pop tarts for me. And that raspberry icing sounds fabulous! PUNCHDANCE about it! It’s raspberry pink, yo!